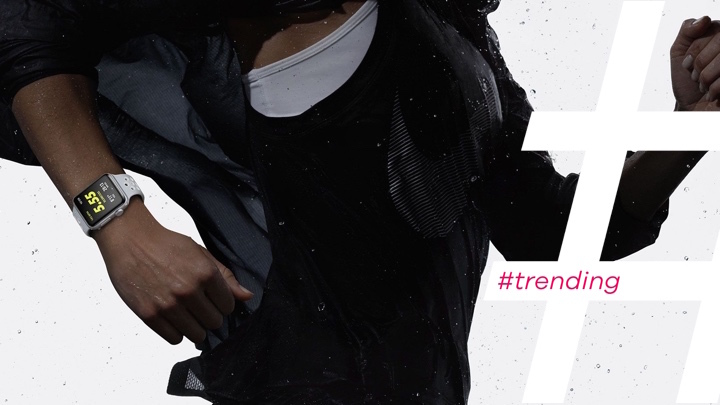 This week there's only one thing we can talk about in #Trending and that's Q2 earnings. Okay, don't all get excited at once. Now, we do prefer to spend our time talking about new wearables as opposed to how much money the companies making them are pocketing. But they do always make for interesting reading and can give us an insight into the current state of wearables and what's working and not working. After dedicating some time to Q1 talk back in May, it's time to turn our attention to how the likes of Apple, Garmin and Fitbit have fared in the sales department over the last few months and find out who is out on top. Yes, Apple were the first to talk business revealing that sales of the Apple Watch are up 50% on the same period last year. Impressive. How many watches is that then? This is the problem. Apple doesn't typically reveal precise sales figures of its hardware. It also usually bundles the Apple Watch into its 'Other' category of products when it's talking about Watch sales. That 'Other' category racked up 2.7 million sales, but it's not clear how much its smartwatch accounts for that number. So we have no idea at all? Well, this is when we turn to the analysts to give us a rough idea about what we are dealing with here. According to Creative Strategies analyst Ben Bajarin, these figures suggest that Apple shifted something in the region of 2-3 million units in Q2. That's in comparison to the 5.3 million (Q1) and 2.6 million (Q2) estimates in previous quarters, which sounds like Apple is still pretty good on this front. Unlike Apple, Fitbit does talk numbers and revealed that it sold 3.4 million devices in that same period, raking in $353 million in revenue. It also claimed that demand for its trackers were better than anticipated. So it's good news then? Not quite. While that revenue figure might sound impressive, it's actually a 40% revenue slump, which is a third quarterly decline in a row for the company. In Q1, it sold 3 million devices and reported $299 million in revenue. Why is Fitbit not dominating the field? While it has been leading the wearable charge in the past, the emergence of other major players like Apple, Xiaomi (more on Xiaomi in a moment) and Garmin are taking a bite into those sales. Yes, Garmin announced results for its second quarter with the company revealing a total revenue of $817 million. That revenue covers a whole host of devices of course, not all of which are wearables. But many are and it seems that Garmin's Fenix 5 collection was a big part of its sales success during this period. But it's not all good news. In the fitness segment of its business, revenue actually declined 15%. That decline was linked to a general decline in the basic activity tracker market. A market where Garmin does have devices like the Vivofit 3 to offer tracking on a budget. It's also an area where Fitbit has plenty of options too with the likes of the Flex 2 and the Fitbit One covering the budget bases. So, who's king of the wearables? Is it Apple, Fitbit or Garmin? Actually, it's none of them. Step forward Xiaomi as the biggest selling wearable tech device maker. That is at least according to data analysis outfit Strategy Analytics which believe it has the figures to back that estimate up. Xiaomi shipped 3.7 million devices in the second quarter of 2017 giving it 17% of the market and putting it ahead of Apple, Garmin and Fitbit. Those sales meant a rise on the 3 million units it shipped in Q2 2016. We should also remind ourselves that Xiaomi's wearables are firmly focused on its Mi Band fitness trackers. The same basic fitness trackers that are apparently in decline according to Garmin's report. It seems that in China though there's more of a demand for tracking on the (very) cheap than there is in other territories. Xiaomi is top for now then? That 17% share of the market is closely followed by Fitbit with 16% of the wearable market and if we go by those Apple estimates, the Cupertino company can't be that far behind either. We also haven't talked about Samsung either and its smartwatch, fitness tracker and hearable launches this year. With Fitbit set to launch its first smartwatch before the Holidays and an Apple Watch Series 3 increasingly likely to turn up as well, that stint on the top may well be short lived.